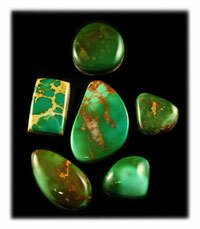 Royston Turquoise comes from the Royston mining district located near Tonapah, Nevada. "Royston Turquoise," originally consisted of four old Turquoise claims: Bunker Hill, Easter Blue, Oscar Wehrend, and Royal Blue. 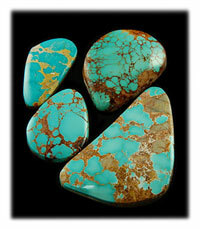 Lynn Otteson moved to Tonopah to mine Royston Turquoise in 1958 and the family have been Turquoise Minors since. Royston Turquoise in known world wide for having a wide range of Turquoise colors from a beautiful soft blue to emerald greens. The color of Royston Turquoise often runs together in the same rock which creates some of the most spectacular Turquoise stones on earth. Today the Royston Turquoise mining district is primarily controlled by the Otteson family. Dean and Danny Otteson, (brothers) mine what is now known as Royston Turquoise. 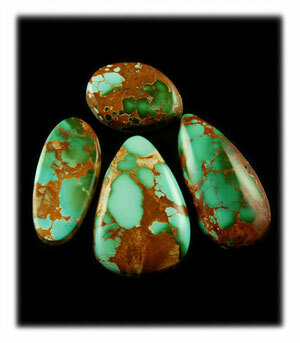 Once the Turquoise is out of the ground, it is processed, sorted for quality and carefully allocated to the proper artists for Turquoise Jewelry to be made, so that Royston Turquoise is synonomous with quality. Dean and Donna Otteson have a ranch across the valley with a beautiful view of their Royston Turquoise Mine. They raise horses and enjoy a most colorful life in what is still the wild west. 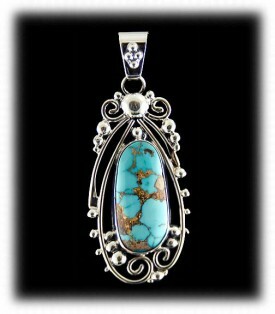 If you would like to know more about Royston Turquoise or would like to look at some finished Turquoise Jewelry made with this beautiful Turquoise and Ribbon Turquoise follow the links on the left hand side of this page or at the bottom of the page. 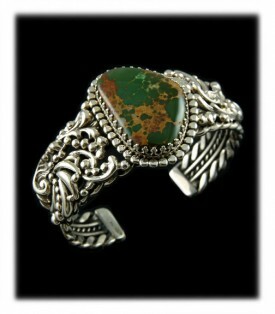 We carry only American made sterling silver and 14k gold jewelry made in Durango, CO, USA. You will love our selection of natural Royston Turquoise jewelry, such as our Royston Turquoise Rings. 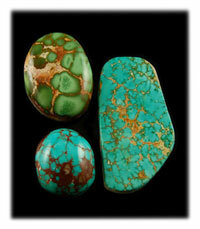 We will be offering high grade Royston Turquoise cabochons and Royston Turquoise Jewelry on this site. Durango Silver Company will stamp "Royston Turquoise" on all Royston Turquoise jewelry made with the Ottesons Royston Turquoise so there is no doubt of the stones origin in the future.